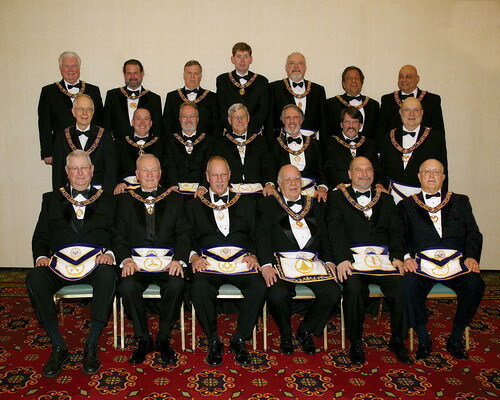 2009 Grand Lodge Officers – The Grand Lodge of Connecticut A.F. & A.M.
(front row, from left): RW Brothers Charles C. Maxson (Grand Treasurer); James T. McWain (Grand Senior Warden); Charles A. Buck Jr. (Deputy Grand Master); MW Brother Arthur H. Carlstrom (Grand Master); RW Brothers Gary W. Arseneau (Grand Junior Warden); Robert G. Fitzgerald (Grand Secretary). (Middle row, from left): RW Brothers William F. Lott (Deputy Grand Treasurer); Michael B. Dodge (Grand Senior Steward); Simon R. LaPlace (Grand Senior Deacon); Donald W. Dean (Grand Marshal); Thomas M. Maxwell II (Grand Junior Deacon); Theodore J. Nelson (Grand Junior Steward); Anderson H. Ziedler, Jr., (Deputy Grand Secretary). (Back row, from left): RW Brothers Robert L. Jess (Associate Grand Tiler); Martin L. Rudnick (Grand Lecturer); Richard C. Memmott Sr. (Grand Tiler); Carl H. Anderson (Grand Organist); Bruce R. Bellmore (Grand Chaplain); Gary A. Littlefield (Grand Historian); Joseph F. Massa (Associate Grand Tiler). Grand Tiler Richard C. Memmott Sr.
Deputy Grand Secretary Anderson H. Zeidler Jr.
Grand Trustee (2008) Stanley S. Sheldon Jr.
Grand Trustee (2009) Kenneth B. Hawkins Sr.